A little while ago I saw some cool mini hopper patterns on Ben's blog Arizona Wanderings (go check it out!!) that I was very intrigued with. Reading through his posts, Ben mentioned that he got inspired by Jason's Klass' video of tying the Balloon Caddis. That post had me also tie some Balloon Caddis last Fall which I fished successfully in the high country. But Ben took this pattern a step further and transformed this European fly (developed by Austrian fly tyer Roman Moser) and transformed it into the Mini Hopper. 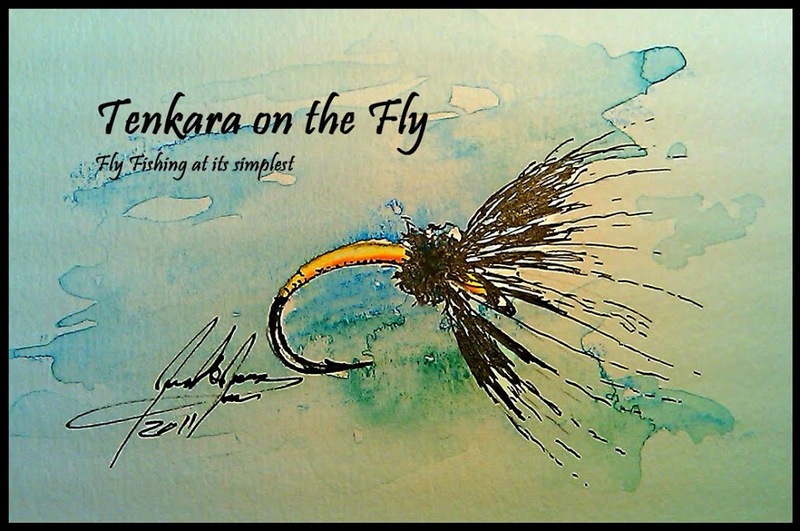 To me, this created the perfect hopper pattern for Tenkara, a fly that is not too large but still has the attributes of a hopper, floats well, wiggles, you name it. I am planning to use this fly this Summer, both alone or in a "hopper & dropper" rig. Based on how successful the Balloon Caddis is, I am sure this fly will not disappoint. Arizona Wanderings' Mini Hoppers - are you ready for Summer? Aren't those some tasty morsels for hungry trout? Winter is over, yes it is! What a weekend. My girls went to Atlanta to be with my wife's family (my dad-in-law is finally out of the hospital and in rehab) and I stayed behind for a week before I catch-up with them. Of course, the whole weekend was all about fishing. Saturday morning I headed to the Columbia outlet store to get some fishing shorts (long sleeve; the sun in Colorado is brutal). At noon, there was a book signing and presentation by Steven Schweitzer, the author of "A Fly Fisher's Guide to Rocky Mountain National Park" about fly fishing in Rocky Mountain National Park in my local fly shop Hook Flyfishing. I bet this book will become the bible of fishing the Park. It is choke full with information and a review will be forthcoming. After the presentation I talked to Steven about Tenkara and how well suited it is for the Park. Steven never tried Tenkara but I was able to talk him into trying this Summer. We will be making plans hopefully soon. I also met a newly convert to Tenkara and talked shop with him and showed him my stuff that was already in the car. After the presentation, I jupmped into the car and headed out to Bear Creek. I hoped that it would be a better experience than last time when the river was still frozen in many places and you could literally walk over it. What I found was more than I hoped for. There were fish rising and they seemed to be again in all the places where I would expect them to be. Winter let go of its grip and Spring moved in. Trout where active, rising to midges and yes, a few blue winged olives. I rigged my Caddis 330 with a level no. 3 Tenakarabum flurocarbon line, one of Joe Leal's CDC Takayama Sakasa Kebari and a mercury RS2 as a dropper. Off the bat, trout were interested in both flies, taking mostly the mercury RS2 but a few came up and took the dry. I was thrilled! The day yielded just about a dozen hooked trout (I count those as caught) some of which where LDR'd (long distanced released) and maybe 5 were brought to net. My Tamo got a workout and proved to be the most functional landing net I ever owned. The way the handle is slanted and shaped, it allows you to hold it behind the knee while kneeling down, keeping both hands free to snap a few pictures before releasing the trout as well as keeping the trout in the water while doing so. Resident Brown, harvest encouraged but why would you? ﻿﻿﻿I noticed that I did have some issues hooking trout properly or keep them hooked, I think this might be due to the softer action and soft tip of the Caddis 330 to which I haven't adjusted. I understand that some are practicing the hookset by setting the rod down instead of us (sort of a roll cast hookset). I tried many times but each time bang! my hand went up instead of down. This is something I would want to focus more going forward. An added bonus will be that any hookset that didn't work out would not mean that you have to climb on that tree behind you to get your rig back. Anyway, I do like the Caddis 330, it is a great little entry level and economic rod and will give you a taste of Tenkara but my favorite rod is still the Tenkara USA Iwana 12ft. Since I don't have the 11ft model, I can't do a side-by-side comparison of the both. Sunday was one of the few stellar days that I will remember fondly for a while. I went up to Bear Creek again, the forecast called for a very windy and gusty day and Bear Creek is actually fairly well protected from winds in the Canyon (well, for the most part). I decided today to head downstream first, a stretch of river that I never really explored. I heard someone talk about a beaver pond and thought this might be interesting... As soon as I hit the river, I started picking-up trout pretty much where I thought they would be, confirming that they definitively left their Winter lies and became active with rising temperatures. I fished all day with two patterns only, a CDC and Elk that served as my "indicator" and a dropper on abut 2ft tippet - the dropper being either a mercury RS2 or regular RS2 with some fluff as wing case. All but one trout took the dropper, which made sense since there is a significant baetis population in the creek and next to midges I also spotted some early blue winged olives on the water. The CDC and Elk is a delicate fly and acts as a very effective "strike indicator" for such a light setup (no weight). Even the slightest hesitation translates visually well and there is no "weight" that would have to be pulled down and spook trout. The most fun I had was inthe beaver pond where I saw a few trout picking little stuff off the surface. I sneaked-up on them from behind, climing over the dam and then very slowly wading through the much into position. I knew they would not be interested into my CDC & Elk so I tied on a simple RS2 with a feather fluff as wing case as dropper. One little guy came up and splashed on the dry but soon he took the emerger and was mine. I picked-up 4 trout out of the pond and started moving upstream through the previously fished pools and up where I typically fish, catching a trout here and there. Later in the afternoon, the wind started to be very gusty, they kind of wind where you make a forward cast but the line is still somewhere behind you or in the tree. I waited until the wind stopped and made my cast, but it was not very enjoyable anymore, especially since it became quite cold. But, overall, I caught 21 beautiful gems and 14 came to hand. ... but no green sprouting yet. The day ended with a fine micro brew (amber wheat) and a tasty pizza from my favorite place, Garlic Jim's.